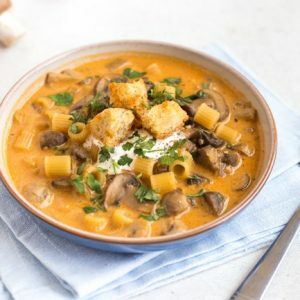 I know some people hate that word, and it’s true that it sometimes has negative connotations – used to describe the sort of person who turns their nose up at anything short of champagne and truffles – but personally, I think it just means someone who loves food. And using that definition, I am definitely a foodie. But one thing I’ve never done is a food marathon. In fact, I never even knew it was a ‘thing’ (but it will most likely be the only kind of marathon you’ll ever see me doing). If you fancy taking part in your own food marathon, you need to check out the 200 Club – the longest tasting menu in the world. It’s a one-off event taking place in London on 3rd-4th September, and it’s 24 hours of nibbles and light bites, comprising 200 courses in total – that’s one every 7.2 minutes. For a whole day! It’s not just dinner, it’s a full-day experience of breakfast, elevenses, lunch, afternoon tea, dinner, and much more, all cooked by genius chefs Bompas and Parr. Just one glance at the guys’ website gives you an idea of the sort of amazing projects they’re known for! Does this not sound like the coolest thing ever? Take some friends along and make some memories! 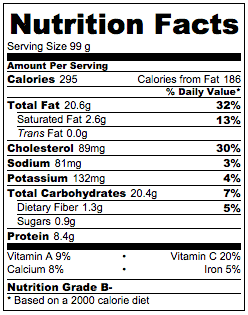 I’m all for eating in moderation, but… sometimes you’ve just got to splash out. Of course, not everyone has 24 hours to spare. Totally understandable, but you can still join in! 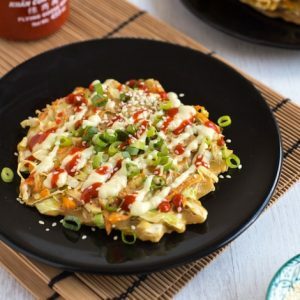 If you don’t want to buy a ticket for the full 24 hours, you can also book tickets for the event in two-hour slots, which means you’ll get to try 20 of the tasty meals – and there are time slots all throughout the 24 hours. Full 24 hour event: tickets here. Tickets for two-hour slots: here. In conjunction with the 200 Club, Bespoke Offers is launching 200 other cool foodie experiences on the site as well, so if you can’t make this one, take a look around and see what else catches your eye. As a nod to the tasting menu you’ll find at the 200 Club, I thought today’s recipe should be a cute little appetiser. 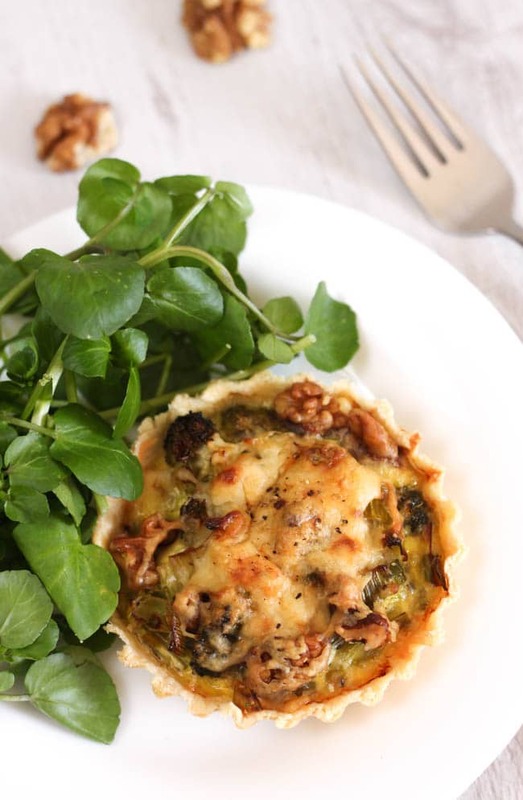 These smoked cheese, walnut and broccoli tarts are only about 4 inches across, so they make a great starter – or you can add a few side dishes to make a full meal. 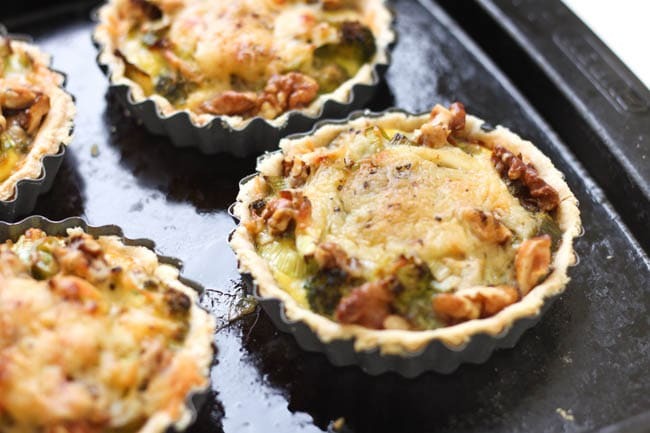 They’re stuffed with garlicky leeks, broccoli and walnuts, and they’re topped with smoked cheddar cheese – absolutely delicious. I’ve had these little metal pie dishes for a while now, and I’ve finally got around to using them. If you don’t have any, I’d really recommend getting some (turns out I’m now a kitchen equipment pusher…). 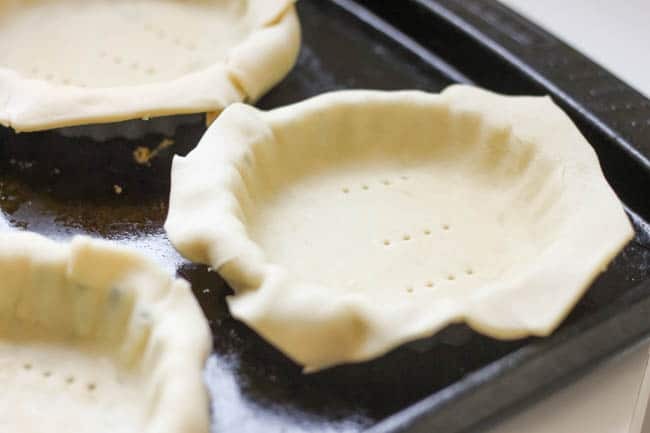 They’re easy to use, and the metal edge helps to cut the pastry in just the right place – lining them with pastry is a breeze. Make sure you blind bake them for ten or fifteen minutes before you trim the edges of the pastry, as the it does shrink a bit when it starts to cook. 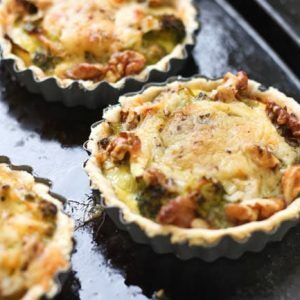 Walnuts might seem like an unusual addition to these tarts, but as they bake they lose their intense crunch, but still have a bit of bite to them, which goes really well with the soft vegetables. Don’t skip them! And if you’d like to emulate your own 200 Club at home, I’d recommend eating all four of these broccoli tarts one after the other, exactly 7.2 minutes apart. Do you think you could manage the epic 24 hour tasting menu at the 200 Club? On a floured surface, roll out the pastry until it's very thin (even if it's pre-rolled). Cut into four squares measuring around 6 inches. Lightly spray four mini pie dishes with oil (mine measured around 4 inches in diameter), and lay a square of pastry over each. Lifting the edges of the pastry, gently push it into each pie dish with a knuckle, being sure to push the pastry right into the corners. Trim off any large amounts of excess pastry (I find it easiest to use a pair of scissors), leaving around a centimetre excess around the edges of the pie dishes to allow for the pastry shrinking. Prick the pastry a few times with a fork, and bake for 10-15 minutes, until just starting to firm up. While the pastry is baking, heat the oil in a pan, and add the sliced leek and small florets of broccoli. Cook over a medium heat for a few minutes until fragrant, then add the garlic. Cook for a few more minutes until the vegetables are soft. 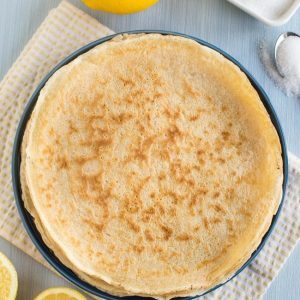 When the pastry cases are ready, trim the excess pastry from around the edge with a sharp knife (rest it along the edge of the tin and it should be easy). Add the leek and broccoli mixture to the four pastry cases, and pour over the beaten egg. Scatter over the roughly chopped walnuts, and top with the grated smoked cheddar and a little black pepper. Return to the oven for a further 40 minutes or so, until the cheese is golden brown and the egg has set. 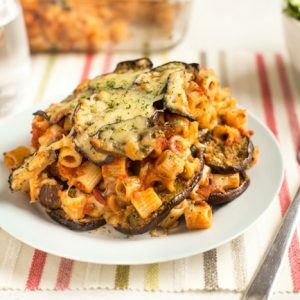 These sound delicious :) Thinking of making them as the veggie alternative on Christmas Day. Do you think they would reheat ok if I made in advance (and possibly freeze, depending on when I make)? Thanks! I made this the other day with a number of modifications. It turned out well, so I thought I’d share. 2. Smoked cheddar is… available in this country, but you’d have to go to an actual cheese shop and pay a small fortune for it, so that sort of thing is not for cooking with. Used regular cheddar instead. 3. I don’t have those small tart dishes, so I made a regular sized one instead. Used two leeks, a whole head of broccoli (didn’t use the stem), a small handful of walnuts and four eggs. Didn’t use extra garlic though, because I don’t care much for it so tend to use it quite sparingly (often, I just skip it entirely). 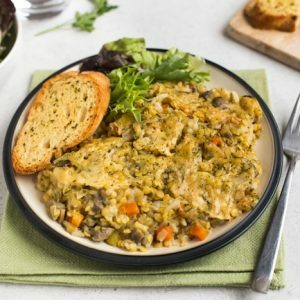 I’ll definitely do it again (with my neccessary modifications), but because it’s so much larger than yours, next time I’ll probably mix the cheese into the vegetables or possibly the eggs instead of just putting it on top. I considered adding some creme fraiche to the eggs to make it more flan-like, but decided against it and I don’t think I will do so next time either. I quite liked that the vegetables were standing more on their own like this than in a typical flan. Glad you enjoyed it! Your modifications all sound very reasonable :) thanks for the comment! 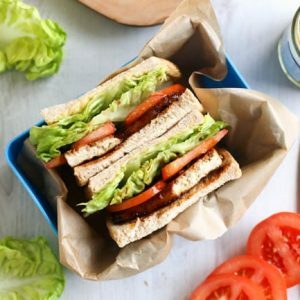 Never heard of a food marathon before – love the idea of that! Your tarts looks delicious too! :) Pinning! Pretty much love eveything about these, including those cute little tins!! I am digging YOUR definition of a “foodie” and why Yes, I would consider myself one! I am also digging the 24 hour food marathon! How awesome is that!! I totally WISH I could attend, I am sure it is worth every calorie! :) Also on my list of things I dig- these tarts! They are fabulous! 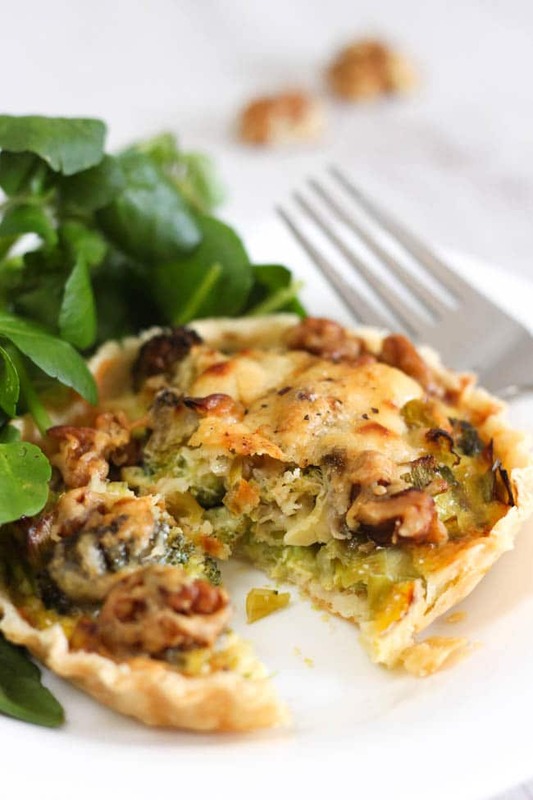 Love that they are stuffed with leeks, broccoli and walnuts! Plus that smoked cheddar topping! SERIOUSLY YUM! Pinned! Cheers and thanks for sharing the deliciousness! Haha! Wow I love your enthusiasm ;) thanks for sharing! That’s my kind of marathon! Your tarts look AMAZING. What a great combination for a tart! Pinned and shared! YUM! 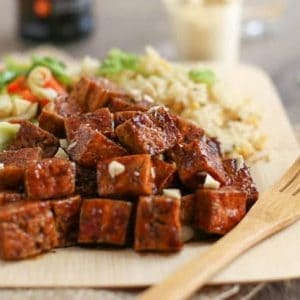 I would agree with your definition of foodie–I am one who simply loves food! The 200-club event sounds super awesome!!! And I am loving these cute walnut cheese tarts. Definitely pinning to try soon. Wow these tarts look mouthwateringly amazing and the event sounds totally out of this world – a foodies Utopia for sure! in instead. My Vegetarian daughter and my hubby hate onions so shall sneak in a pinch of onion salt instead. Thank you once again for a lovely looking dish. I have some of those little individual tins and I’ve never used them either, so you’ve inspired me to actually get my finger out and use the. Cute wee tarts like these would be perfect for packed lunches. Mmmm….these little bites look heavenly! Don’t think I’d make the marathon, but I’d love to try this! I’ve never heard of a food marathon before! Definitely an intriguing idea. But what I’m really excited about is these tarts! They sound delicious, and perfect for the beginning of fall. Wow these look so good! Bookmarked and will be trying soon! The perils of reading blogs before dinner!! Woah these look absolutely delicious! and the photography is on point! Wow, I think I’d have to book a two hour slot – not sure I could do 24 hours. It sure does sound delicious though! What a fun idea! 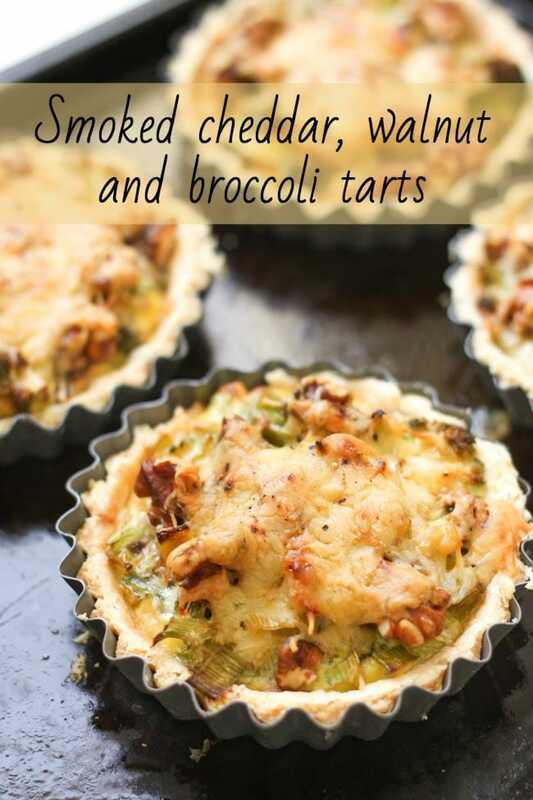 Love your delicious smoked cheddar, walnut and broccoli tarts – they look and sound wonderful!